Sal Najar, center, a student at Beaverton's Mountainside High School, returns to his seat after his testimony on House Bill 2019 before the Joint Committee on Student Success at the Oregon Capitol in Salem, Ore., Thursday, April 11, 2019. In fact, no one argued against the bill that’s come out of more than a year of meetings. Instead, advocates for the state’s youngest children and students in college and universities pressed lawmakers to stretch the dollars to help their priorities as well. 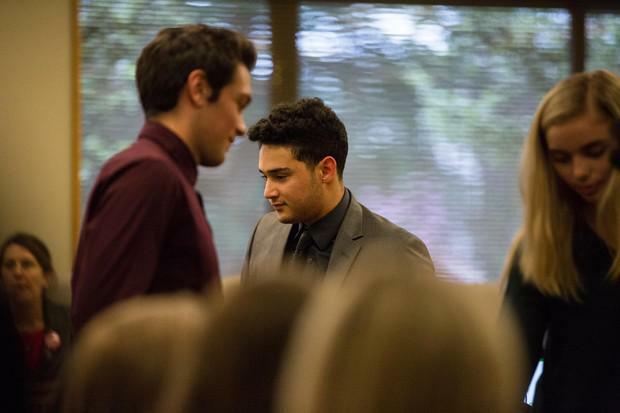 Sal Najar, a student at Beaverton’s Mountainside High School, urged committee members to focus on investments that will help close historic achievement gaps in Oregon schools. 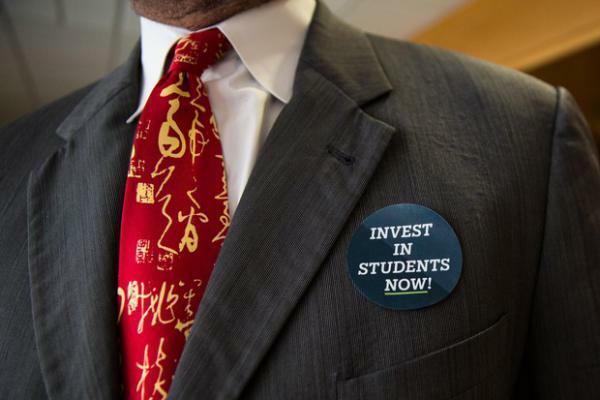 The Student Success Plan would direct money toward reducing achievement gaps, through steps such as reducing class sizes. Another high school student, Hailey Hardcastle of Sherwood, hit on another priority of the legislators’ plan: student mental health challenges often caused by traumatic experiences that occur outside the classroom. “Growing up, my family struggled with food insecurity, and I worked through my own mental health issues, and I know that I wouldn’t have been able to succeed in school without the resources my district offered,” Hardcastle told the committee, as she also warned legislators that budget cuts in Sherwood threatened services she has relied on. Committee leaders have said their mandate, fulfilled over a fourteen-month odyssey of student meetings and lengthy hearings in school auditoriums, was to help K-12. But committee members repeatedly heard about the importance of preschool programs, so House Bill 2019 includes $200 million in annual funding for programs before students enter kindergarten. Public health advocates and the nonprofit Children’s Institute echoed the calls for investing in programs to help the youngest children have a strong start. 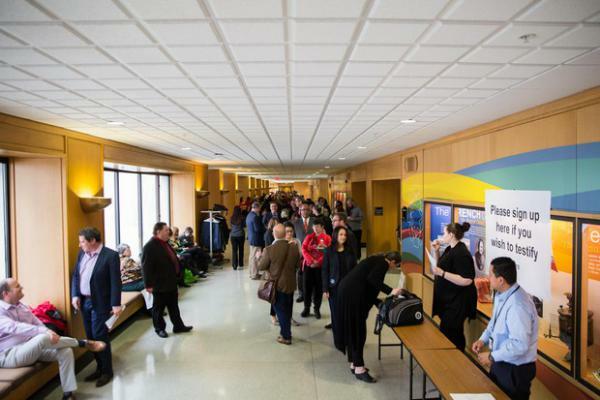 Community college and university students spoke in favor of spending to keep college affordable and to support programs aimed at the state’s workforce. As advocates repeatedly pointed out to committee members, Gov. Kate Brown recommended funding elements of higher education in her proposed budget. 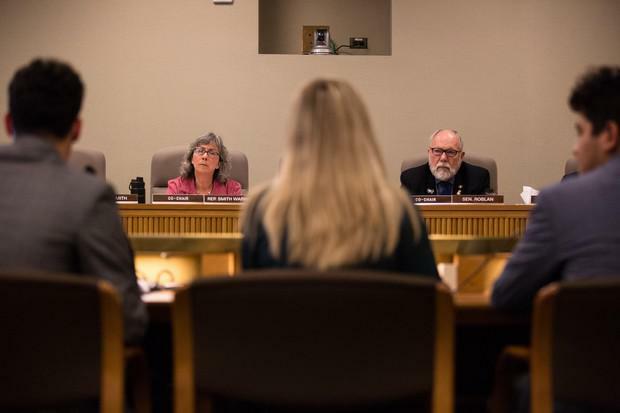 A number of community college and university students urged committee members to take action to reduce the cost of college and invest in financial aid programs, such as the Oregon Opportunity Grant. Jen Arness, a Portland Community College student and board chair of the Oregon Community College Student Association, told committee members she was missing precious class time to deliver a message that they need to fund the opportunity grant program and invest in career-technical education at the college level. “I’ve had to work multiple jobs while going to school part-time for four years to be able to afford the cost of living and an associate’s degree,” Arness said. She said she was homeless for one of those years, a problem she sees her classmates struggling with as well. “Many of my peers find themselves sleeping in their cars, despite working long hours, due to the cost of living, tuition and cost of textbooks, even at a community college,” Arness said, her voice shaking. Several community college students and faculty members pressed the committee to extend its planned K-12 investments in career-technical education to community college. Clackamas Community College student body president Claire Hanson argued that investing in career-technical education would have a direct economic benefit, by providing qualified workers to local businesses with thousands of job openings. “Among those vacancies were jobs in construction, manufacturing, healthcare, and again, CTE jobs,” Hanson said. Halfway through the hearing, committee co-chair Rep. Barbara Smith Warner announced that the draft revenue proposal had posted to the legislative web site. But the dense, 25-page amendment was not the focus of the Thursday night testimony from school advocates. The basic formula for the tax proposal is familiar. That new business tax would exempt the smallest businesses but would charge a flat fee for those with up to $1 million in annual revenue. The largest businesses would pay the largest portion, of 0.49% on Oregon sales, though they could deduct certain labor costs. While most of the speakers were focused on other ways to use any new school money, one business person did weigh in on the tax portion: Tina Lyons advocated for a more nuanced tax system. “I think it’s important to point out that the taxes on gross receipts, not on profit,” said Lyons, noting that her company may process a million dollars, but that comes as a pass-through, so it’s not money that turns into profit. Committee members have been aiming for the new tax to yield about $1 billion per year in additional revenue. To offset potential costs to consumers of taxes on commercial activity, the committee has included a reduction by 0.25% in personal income tax for many Oregon taxpayers. The revenue amendment will come up for discussion at the committee’s next meeting on April 16.